The bacon is usually baked in the oven on a wire rack – not only does this mean a lot of the excess fat runs off but it cooks to her liking “flabby and chewy.” Her words not mine. Since I have the oven heated up I have taken to baking the eggs in little ramekins with cheddar cheese sprinkled on top. We would often have this for supper when I was a child – fresh farm eggs with orange yolks and some hand churned butter made with thick farm cream to top it off – good times. The best part about cooking the eggs this way is the way they puff up in the oven like little soufflés. Place the bacon on wire rack (with a foil lined tray below). 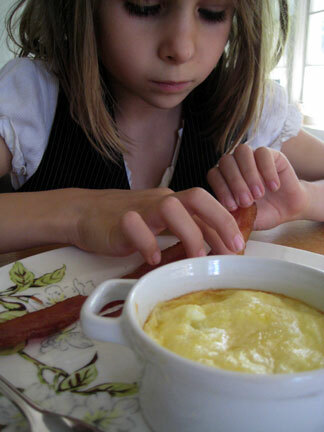 Crack the 2 eggs into each ramekin and sprinkle the top with the cheese, some freshly ground pepper and a tiny pinch of fleur de sel. Cook the bacon and eggs for about 15 minutes until the bacon is sizzling and the whites of the egg are set but the yolks are still runny. 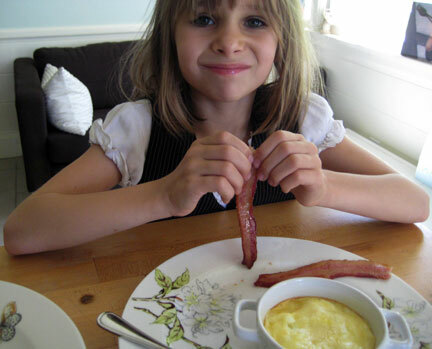 Let cool and then eat eggs straight from the ramekin with the bacon on the side.